After our superb visit to the active volcano of Kawah Ijen, we continued across Java and visited Mount Bromo without a tour. We trawled and trawled the internet and couldn’t find enough details on how to visit Bromo independently. So here it is. 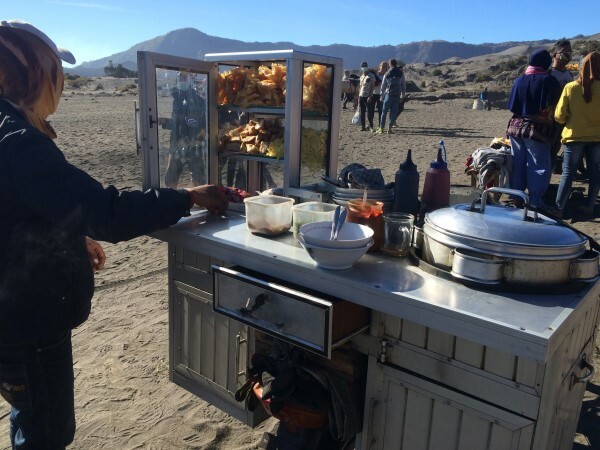 Everything that we found out…about how to get to Gunung Bromo without a tour. Most folks who visit Bromo come from the East. On a tour from Yogyakarta, that takes them to Gunung Bromo, to Kawah Ijen and then onto Bali. We came from Kawah Ijen, aiming to visit Bromo independently. 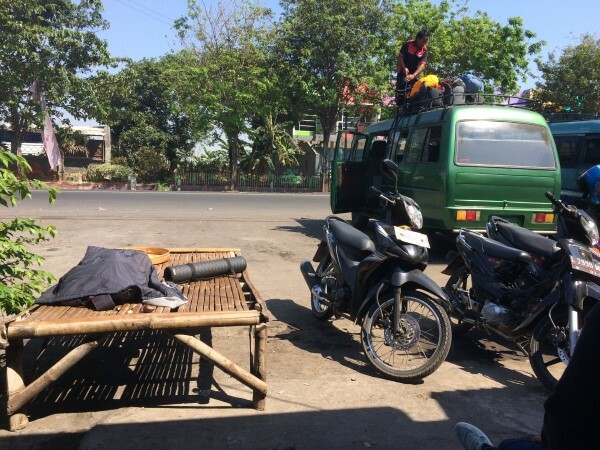 We arrived in Probolinggo on an 11:20 am bus from Banyuwangi (6 hours, 60,000 IDR) that got in at 530pm. 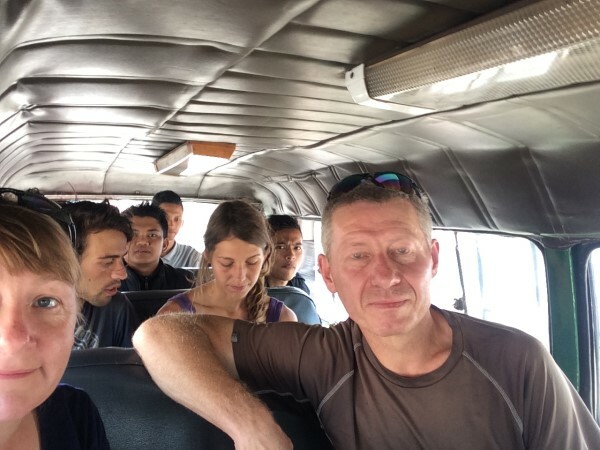 We’d spent the previous night climbing Kawah Ijen and then caught a bus at 11:20am. 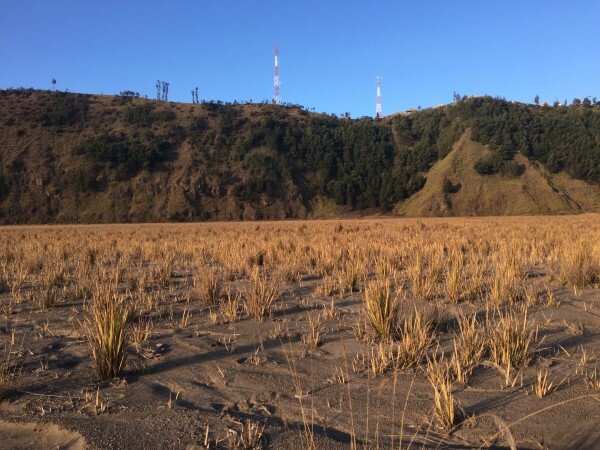 To travel to Bromo indepdently you first need to get to Probolinggo. This is the closest city to Bromo. It has a train station and a bus station. There is a lot of accommodation in Probolinggo. Then, you need to get from Probolinggo to Cemorro Lawang. Cemorro Lawang is on the edge of the Tengger crater. Gunung Bromo is inside this much bigger Tengger crater. In Probolinggo shared minivans leave the mini van station. This is just outside and to the north of the Probolinggo Bus station on the road called Jalan Bromo. It’s about 5km and a 10,000 bemo ride from the train station. There are no signs to the minivan “station”. The row of small eateries (warungs), stores selling snacks with minivans parked in front of them will tell you that you’re in the right place. See also the map above. Minivans to Bromo – when do they leave? Now all you need are 14 other folks to join you in the van. Vans from Probolinggo to Bromo have 15 seats. You can wait in one of the warungs, or on the bamboo platforms until those other 14 folks arrive. The cost from Probolinggo to Cemorro Lawang is 35,000 IDR per person. That’s not the tourist rate, that’s just the rate, because the only folks taking these vans are the tourists. You may find some domestic tourists, but they’re in the minority. Bags go on the roof (and they’re tied on) and there are 15 seats in the van. The vans will go when full. It’s possible to negotiate with the drivers to depart with less than 15 people, but the rate will be 500,000 IDR per van. (Prices at August 2015). Well, not all the time. It’s a case of supply and demand. When we first arrived in Probolinggo (at 17:30 mid week in the third week of August), we waited for two hours until there were a total of four of us wanting to go to Cemoro Lawang. When two of us walked away, the driver offered us a deal. 120, 000 IDR each to go now. We’d been waiting for 2 hours, one guy had hung around for significantly longer than us. When we countered with 60,000 IDR per person, he came back with an offer of 75,000 IDR each. In the end we declined and took a room at the Lava Lava Hostel in Probolingo for the night and tried our luck the next morning. If you’re traveling solo, there’s also the option of a motorbike ojek from Probolinggo to Cemorro Lawang. They go from the same location as the minivan “station”. Just ask around and expect to pay 70,000 IDR. Booking.com and TripAdvisor have a host of places to stay in Probolinggo. Close the bus station there are several places that we checked out. 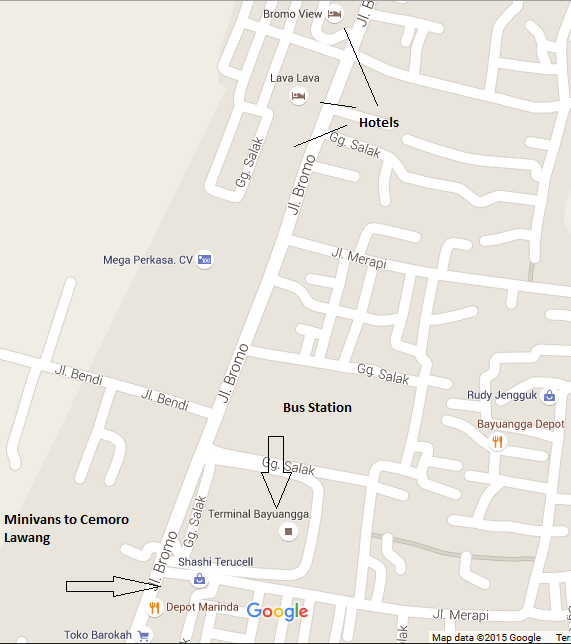 Hotel Moronyoto: closest to the bus station – heading south on Jalan Bromo. It’, 75,000 IDR for a double room, with a bucket shower, no netting or mosquito nets. It has open windows that channel the mosque speaker system. 8-10 minutes walk from the bus station carrying full packs. Lava Lava Hostel: Next door to the Moronyoto. We stayed at the Lava Lava Hostel in Probolinggo. Our room had AC, a private bathroom, a great bed, a good shower, a TV and breakfast included. We could NOT hear the call to prayers from the multiple mosques in the area. There was also wifi in the room for the cost of 250,000 IDR. They can also call ahead and book you a bed or a room at the Lava Lava Hostel in Cemorro Lawang. The next morning, we arrived at the minivan stop at 0900. Four folks had been waiting since 0400, several since 0600, and two since 0830. Our arrival made 12 people, but it was 10am before the driver offered to leave “now” if we all paid 45,000 IDR each. The seats are tragically uncomfortable. The best seats are either the two in the front with the driver or the front row in the back. There’s more leg room and a little more to brace yourselves with when the driver hurls it round corners. In Cemoro Lawang, the van will either drop you in one of two places. Either outside their favorite home stay or at the only junction of note here in Cemoro Lewang. You can see this on the map and on the photo below. Most people arrive in Cemoro Lawang mid to late afternoon. So to get on a minivan that leaves quickly your best bet is after lunch and before 4. The journey from Probolinggo to Cemorro Lawang takes “around 1 hour and 20 minutes”. 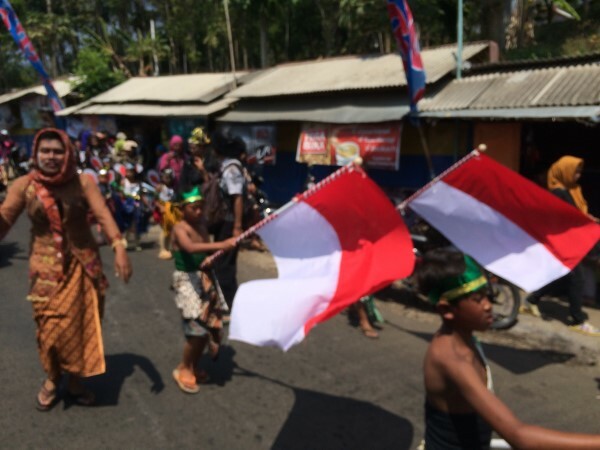 We were caught in an Independence day carnival and wiled away 2 hours 30 minutes in the van on the way up to Bromo. Our speedy return saw us get back from Cemorro Lawang to Probolinggo in just 1 hour and 5 minutes. On the return the van drops you where you picked it up from, or just across the road from the bus station. Getting out is simply the reverse of getting in. You go to where the van dropped you off. Go back to the junction, give your bag to the driver or his mate and wait around. Once the van is full, or the 500,000 fee is met the van will leave. If you want to catch a train, then leave plenty of time. We left Cemoro Lawang at 0920, and managed to make it to Probolinggo in time to catch the 11:12 train direct to Yogyakarta. Surprisingly, we made it! We took a yellow bemo from the bus station on Jalan Bromo for 10,000 each. 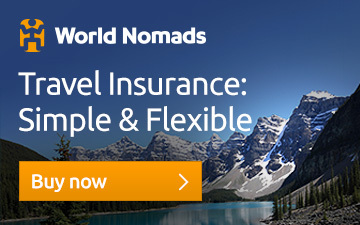 The local rate might be 5,000, but the Bule or foreigner rate is double that. We left the “bus station” at 10:28 and arrived at the train station, where there were no ticket lines and bought tickets at 10:55 for the 11:12 train. Here’s another hint, if you get those good seats on the minivan, you’ll be first out. This means you’ll be first to get into a bemo to get to the station! 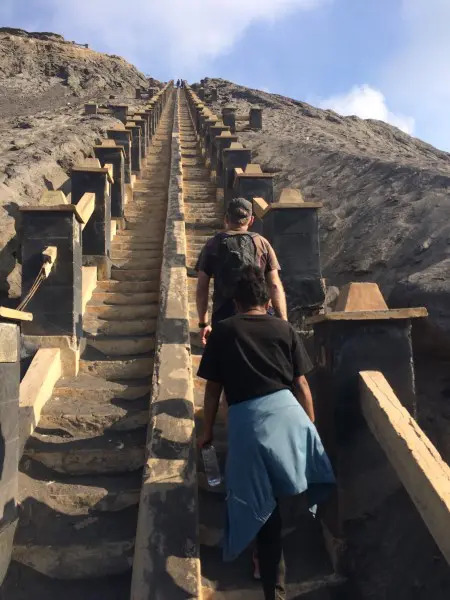 A single road comes in from Probolinggo and leads to a fork, which if you take the left will take you to the Cafe Lava Hostel (in about 40 meters) , the Lava View Hotel, the Bromo Permai Hotel and the National Park ticket office and barrier. The right hand fork leads to the Cemara Indah hotel, where a path takes you down to the Sea of Sands and to the Bromo Caldera for free and is also the route for the sunrise point, if you wish to walk uphill for two plus hours in the dark. The best place to stay to visit Bromo independently is in Cemroro Lawang. The village perches on the edge of the larger Tengger caldera, and allows you to walk into the Bromo National Park. You can find Bromo hotels such as the Cemarra Indah, the Bromo Permai and others on booking.com and through Agoda, however, most Bromo accommodation is in home stays. They do not have a digital presence. It’s cool here on a night, so blankets are generally provided, but no fans or AC is unless stated by the hotel. The primary type of accommodation in Cemoro Lawang is a home stay, which usually has 2-6 bedrooms, with a bathroom specifically for the guests (shared), or private facilities (a lot more expensive). You are unlikely to be socializing with your hosts, its not that type of home stay. Cafe Lava Hostel: the cheapest room is 175,000 a double bed with a shared bathroom. All that was available when we arrived was a “Superior Triple” at 700,000 IDR . You can book ahead through their website – www.lavaindonesia.com or the Lava Lava Hostel in Probolinggo can call for you. The first home stay down from Cafe Lava is the Udin – they have two rooms here, each nicely decorated, with a private bathroom and providing a double bed. Rooms in August 2015 were 300,000 IDR a night. Next down is the Subur – where rooms cost 200,000 IDR each, but when we inquired, they ran off to find keys and never reappeared (although after 4pm, a small boy asked us every time we walked past if we wanted a home stay). At the fork in the road (looking up towards the Cafe Lava), on the left hand side is the Tengger Indah, where rooms were 200,,000 IDR, but again, we couldn’t find anyone to let us even see one. Walking uphill after taking the right hand fork at the junction there are perhaps 8-10 home stays. We only investigated one, which I cunningly forgot the name of it was so horrid, where chalet style rooms (all in a line, with a single bathroom outside at the end) were 175,000. Rooms had a small double bed, much damp and were particularly nasty looking. Prior to the fork (i.e. down the hill towards Probolinggo, but only less than a minutes walk), there’s the Rahayu Homestay and the Teguh home stay (200,000 IDR), Tel: 082 141 98 98 11. 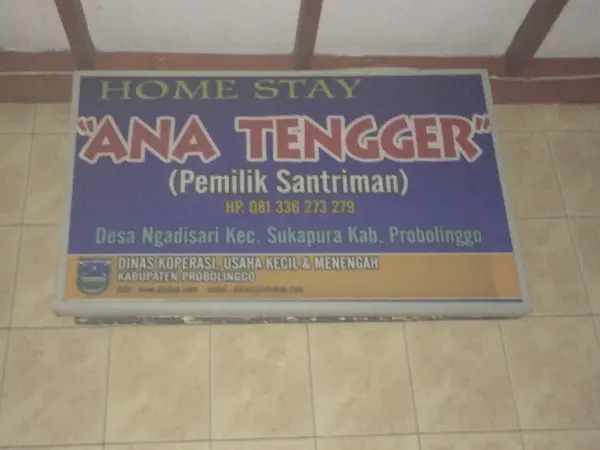 We stayed at the Ana Tengger Homestay, opposite. (Pemilik Santriman) Tel: 081 336 273 279. and we recommend it. There are six rooms available on the main floor and others in the basement. There are also beds available in the hall way. We took a room with a double bed at the back on the main floor for 150,000 IDR. Rooms are airy, very small – with little space to even close the door let along bring your bags in. There is a single bathroom on the main floor – with a bucket flush western toilet, and a wonderful hot shower. Blankets and bottom sheets provided, but no towels or top sheets or breakfast. Take your own travel towel with from our best buy guide to travel towels. Ana Tengger also provides free wifi – which worked the entire time we were there, but was a little slow. There are common seating areas and rooms also have mirrors and electric sockets. You get a key for your room and they also have a nice roof terrace where you can watch the sunset. Stacy, Eva and Andre who we travelled with from Probolinggo shared a room for 200,000 IDR for three people. No food is included or offered in any of the home stay rates. 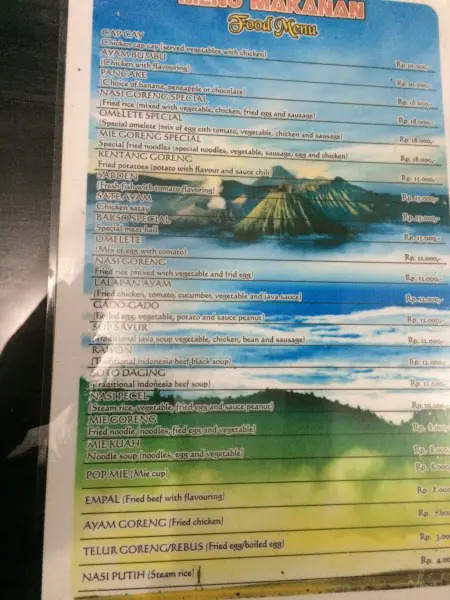 There are restaurants at the hotels mentioned and the Cafe Lava Hostel also has a restaurant (Nasi Goreng 28,000, Large Bintang, 50,000) – however, be aware that after around 530pm, if their accommodation is full – even if you are staying at their sister lodge, the Lava View Hotel, they will refuse to serve you in the cafe unless you are staying at the hostel. It was interesting to see their restaurant less than half full all night with this rule in place. 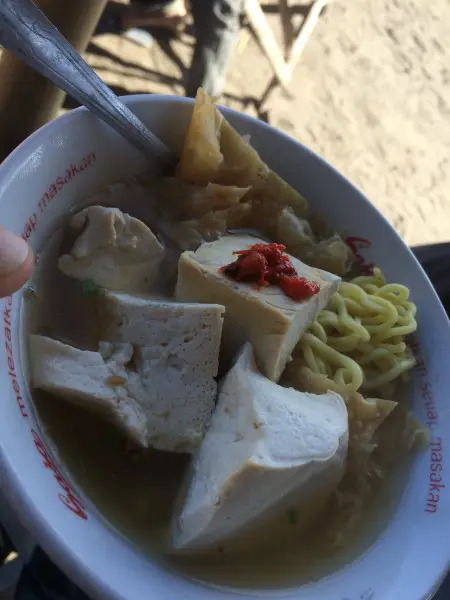 There are many warungs in Cemoro Lawang – serving standard dishes from a pot of Pot Mie (Pot Noodles), to Mie Goreng, Nasi Goreng, Gado-Gado, soups. Warung EDI just up from the Cafe Lava Hostel served good Mie Goreng (8,000), Gado Gado, Chicken Cap Cay (18,000) as well as soft drinks and juices. The fresh fruit juices were 6,000 each and more water than fruit. They also serve cold large Bintang for 35,000. Many warungs simply serve Pot Mie with a kettle and some soft drinks. You can also buy drinks and snacks from a number of small shops around the village. Water will set you back 6,000 for 1.5 litres and large Bintang 30,000 (at the shop on the left after the National Park Ticket office, around 5,000 more in other shops), you can pick up packets of chocolate biscuits from the shop at the fork in the road for 10,000. There are two primary elements to visiting Bromo independently. 2) Viewing the Huge Tengger Crater (it’s 10km across) and the Batok volcano alongside Bromo. 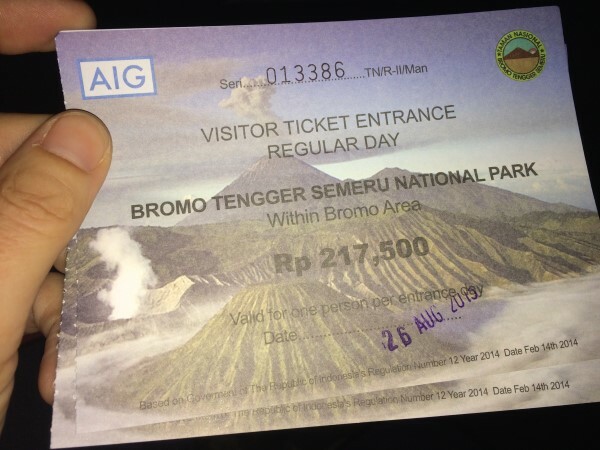 Tickets to Bromo National Park cost 217,000 IDR for foreign visitors and 10,000 IDR for Indonesians. There is a single National Park checkpoint on the road just after the Cafe Lava Hostel/ Warung EDI. This is where you buy your ticket. You can continue on this road, which passes the Bromo Permai Hotel and slopes down to the right. 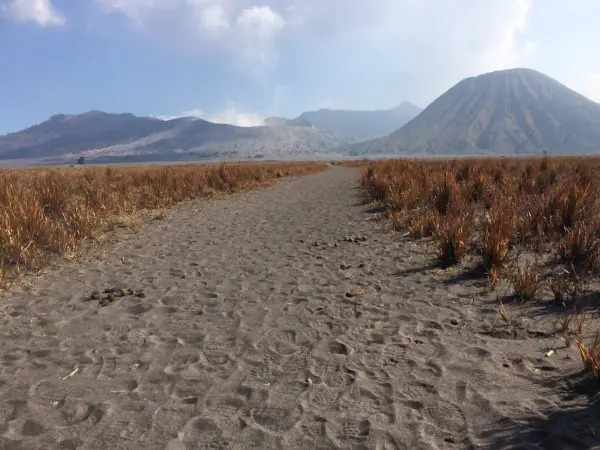 It leads you across the Sea of Sands (a 45 minute walk) and to the base of the Bromo Crater. You can also view the Hindu Temple as you walk across the Sea of Sands. Tickets are valid for a single day and are date stamped. Tickets issued to Indonesian Nationals look different to those issued to foreign visitors (apart from the obvious price difference!). It’s possible to visit the Bromo crater for free. That’s right. Avoid paying the National Park fee. If you take the right fork at the junction in Cemoro Lawang, walk up this road for 5 -6 minutes you’ll come to the Cemara Indah Hotel on your left, immediately at the edge of the crater. After you’ve taken all the photos that you want (come back here at sunset, it’s pretty), take the small sandy track that you see to the right of the parking barrier box. This is described by some locals as the “horse track”. It’s a narrow sandy track, deep sand in places. It winds back on itself several times and you’ll get great viewpoints on the way right down to the Sea of Sands. 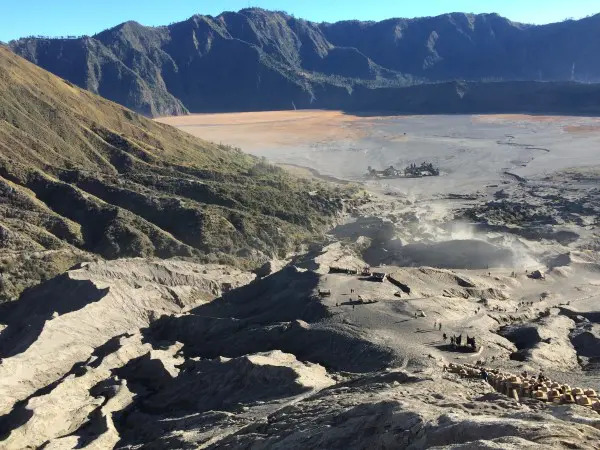 There is no ticket office or any ticket check point this way and you can walk all the way around the Tengger Crater, up Gunung Batok and Bromo and enjoy the park. Return the same way. (when you’re returning, head for the right hand red and white communications towers). Bromo without a Tour. Without Crowds. Visiting the Crater on an afternoon will give you the solitude that a morning visit (when 99% of tours visit) does not. The mid to later afternoon light, also gives beautiful views over the Sea of Sands to Gunung Penanjakan , which is the point where everyone heads to for sunrise and the iconic views of Bromo. From the Hotel Cemara Indah across the sea of sands to the base of the 253 concrete steps that rise to the top of Bromo took us 40 minutes walking. Prior to getting to the steps, there’s an uphill slog that takes perhaps 10 minutes (it’s sandy and a little slidey). The steps will take around 8-10 minutes to go up, depending on how many times you stop. Walk back down the steps, or run down the sand, you’re filthy and sandy now anyways and it’s fun. 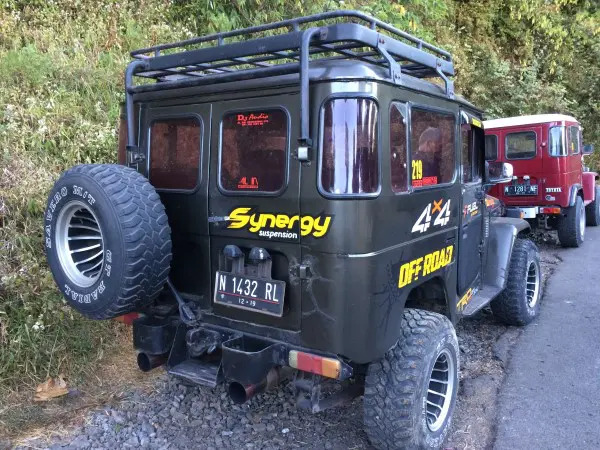 If you visit Bromo as part of a sunrise Jeep tour, after your sunrise viewpoint at Penanjakan, your jeep will drop you in the center of the major caldera – near a “Toilet” building. 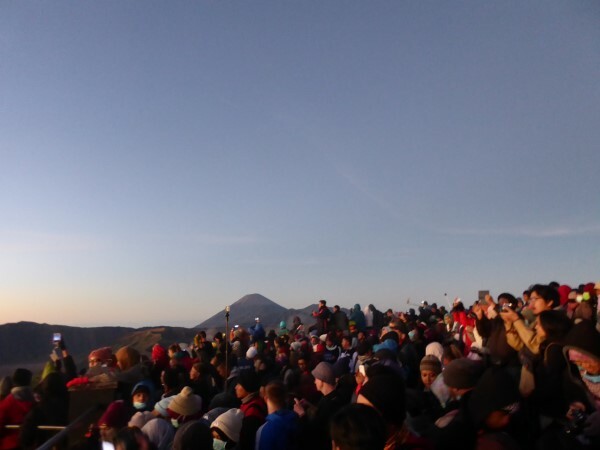 The Mount Bromo tours leave from Cemoro Lawang. 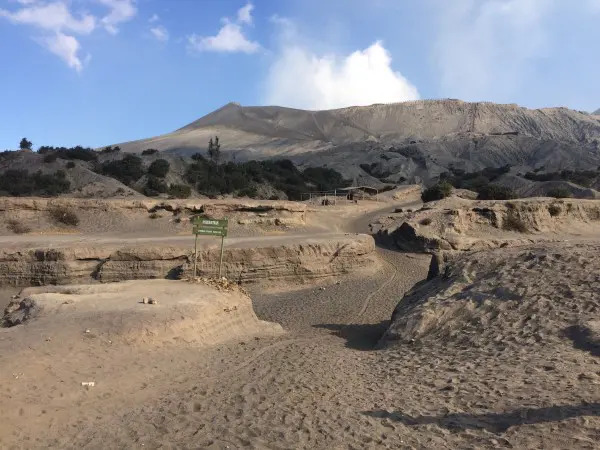 To get to the sunrise point they drive INTO the Tengger caldera (hence you HAVE to pay the National Park fee), through the caldera and up the other side, then up to the Bromo sunrise viewpoint on Gunung Penanjakan. Our jeep left Cemoro Lawang at 0350 and we arrived at the Viewpoint 1 at 0428. We then had to hike up for 10 minutes to the actual viewpoint, returning to the jeep for a 0600 departure. The jeeps return the same way in reverse. We were in the crater again by 0620 and had walked to the base of Bromo’s steps by 0638 and at the top by 0645. Our jeep departed the crater parking at 0800. Walking from the “parking” near the toilet building in the center of the Tengger caldera to the uphill slope area takes 10-15 minutes. Thats why they drop you here, next to where you can hire a horse to take you to the base of the steps (and back if you wish). Note that there are usually 80-90 jeeps on these morning tours – with 5 people per jeep, you can expect 400 people. They won’t all be at the rim of the volcano at the same time, you shouldn’t expect to get any peace and quiet! 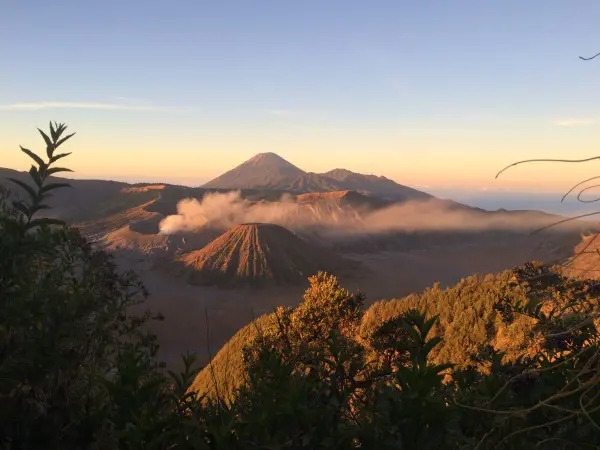 Where to get a Bromo sunrise view – you have options. Walk down past the ticket checkpoint and pay the 217, 000 IDR, take a torch and warm clothes. 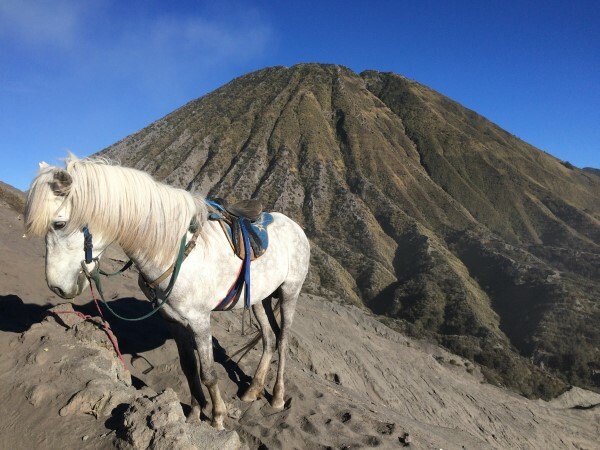 Alternatively, see a Bromo sunrise for free by heading down the “horse track” immediately to the right of the Cemara Indah Hotel Parking booth and pay nothing. In both instances, walk across the Sea of Sands and head up the steps to the rim of Bromo. You’ll need to set off from Cemoro Lawang around 0230, as this hike will take around 2-3 hours. The route goes up past the Cemara Indah Hotel, this map from the Lava Hotel may help. You can organize a jeep tour with your home stay, or with the driver of the minivan who brings you up. 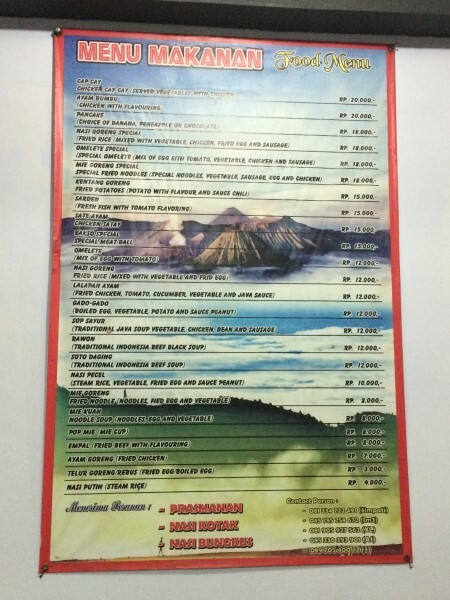 The Mount Bromo Tour Price as of August 2015 is 500,000 IDR per jeep and jeeps will seat five people. The Cafe Lava Hostel runs a shared jeep service for 150,000 IDR per person, organize the night before at the hostel reception. The standard jeep tour will take you to the Bromo view point on Gunung Penanjakan where you can watch the sunrise. This will be with 400 plus new close friends. But you will get to take in the views over the entire Tengger Caldera. The jeep takes you back down to the center of the caldera. 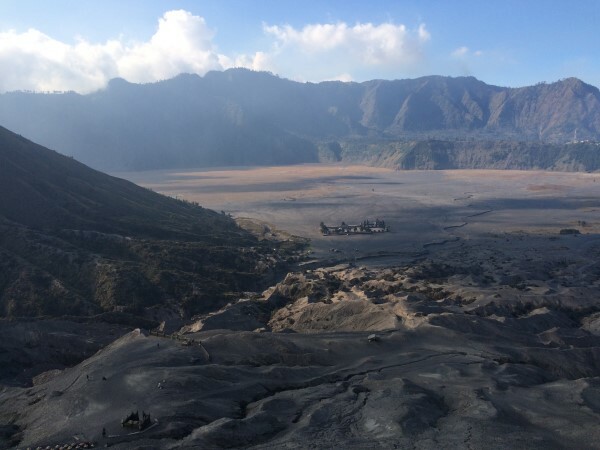 You’ll have around 90 minutes to hike up to the Bromo Caldera Rim and back. 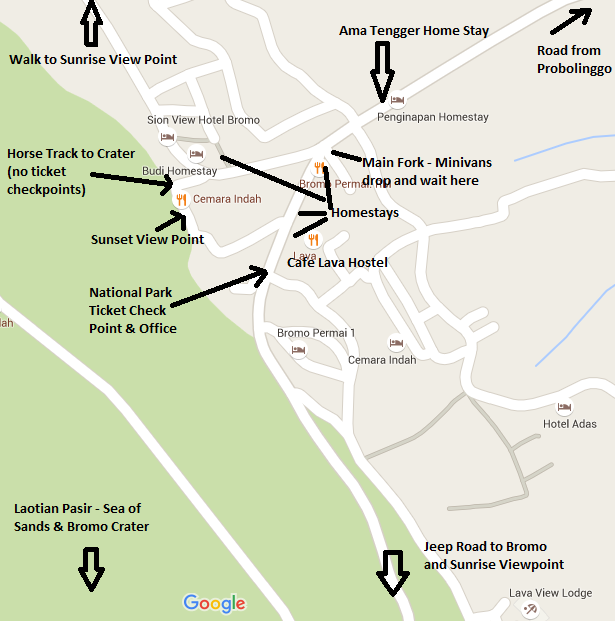 The jeep will then return you to the Cemoro Lawang village center (by the Cafe Lava Hostel or the road junction). You could of course hike back to the village in about 40 minutes). If you take a jeep tour you HAVE to pay the National Park fee. Be aware that the route that the jeeps take goes through the National Park. There is NO WAY to avoid paying the national park fees if you take the jeep tour. You can get to the same (or stop at a slightly lower) viewpoint by doing the hike instead of taking a jeep. The jeep tours arrive back into the Bromo Tengger caldera at around 0630, they will park in the center, near to a building marked “Toilets”. 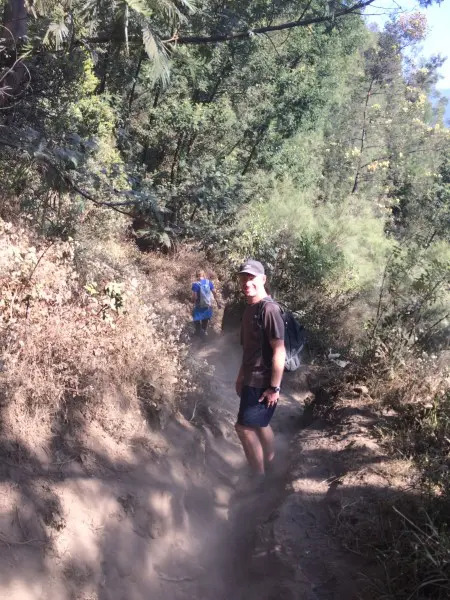 You’ll be besieged by locals with horses at this point, offering you the chance to ride the horse to the base of the steps up to the caldera and back. The horse tour price depends on your ability to negotiate, and again on supply and demand. The walk will take you around 20 minutes to the base of the steps and 8-10 to climb up the 253 steps. Do you need a mask at Bromo? En route to the caldera there are also various stalls – Bakso (10,000), coffee (5,000), water, soft drinks, Pot mie. 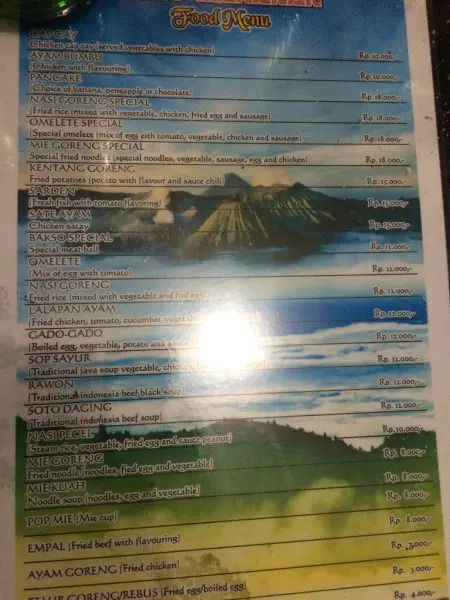 I can recommend the bakso and coffee for breakfast after you’ve tackled the caldera steps. There are benches under tents to sit on and stay away from the sun. There’s nothing much to stop the chain smoking locals who are just waiting and watching for your eyes to water and your nose to run from the very very spicy sambal. While the official fee is 217,000 for foreign tourists, the Lava Hostel folks (and other jeep drivers) will offer to “consolidate” if you pay them 200,000 instead. If you do this, your jeep is waved through the check point and you are unlikely to receive a ticket from the National Park. If you want to have more of a chance of your tourist dollars actually reaching the National Park organization, then you can offer to pay at the ticket checkpoint when you pass through in the morning. Be sure to exit the jeep and pay at the ticket office itself, and get a ticket. You may get offers of “door service” when they will sell you the ticket for 221,000 IDR. You are, though paying over the odds and may not receive a ticket, which means that your fee is going straight into someone’s pocket. 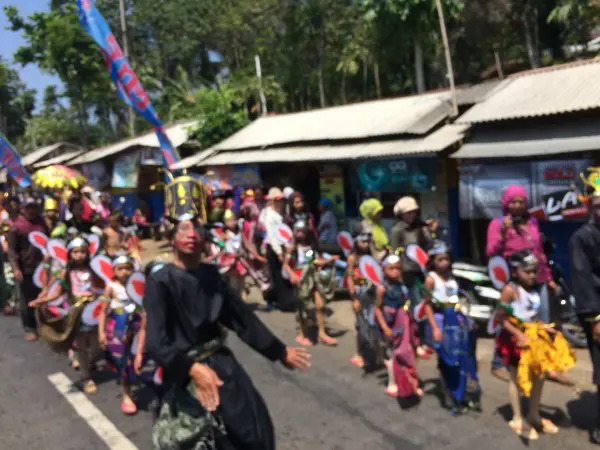 Also if you can pass for an Indonesian national or are of Asian descent, you may be charged full foreign tourist price, but only receive an Indonesian ticket. Demanding a ticket that covers the amount that you hand over reduces in some small way the amount going straight to those who are ripping you off. The Vietnamese girl in our jeep paid foreigner rates and was given an Indonesian ticket. An instant backhander of more than 200,000 IDR for someone! The Bromo area is beautiful, the landscape is lush as you drive up, while the Sea of Sands is desolate and has the feel of the vastness of Mongolia. The village of Cemorro Lawang is sleepy and peaceful. While the accommodation prices may by high for Indonesia comparatively speaking, its a chilled out place that we enjoyed immensely. Visiting, even independently comes at a price, though – in both time spent getting there and seeing the main attraction whilst you’re there. Enjoy! We had an amazing time here. Thanks so much for your kind comments. I agree on the jeeps – the crowds at the top where the jeeps go to were MASSIVE – and walking into the crater when there are no jeeps is just incredible. Enjoy the rest of your travels! This is so helpful! Thanks for writing in such exhaustive detail haha I feel fully prepared for the trip now! 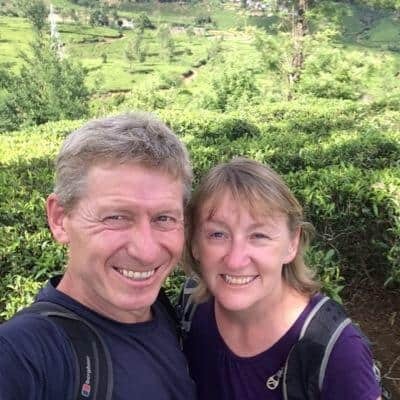 Great to hear Tom, enjoy the trip – hope you get clear weather and a good run! Thanks! 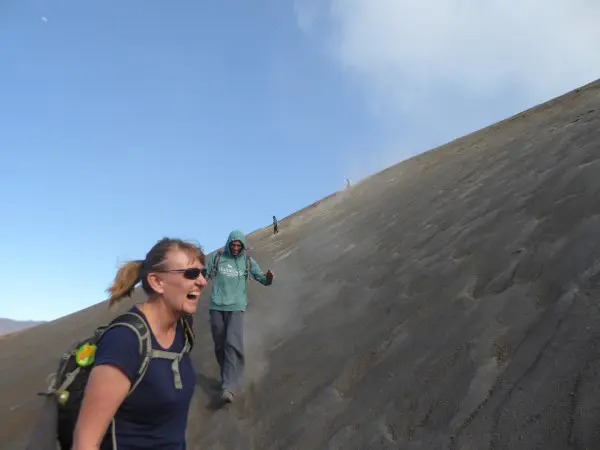 We hope you get there, exploring Bromo without the crowds is fabulous! 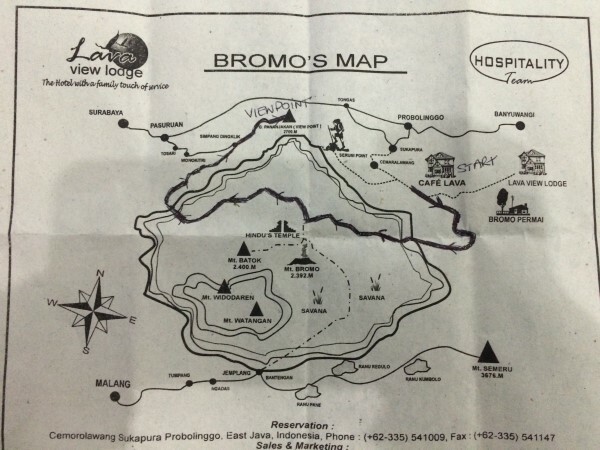 really nice guide about Bromo Very helpful.